I STEP ON AIR is a unique art workshop and a dance performance presented by the exceptional artist Oxana Chi. Her work in the performance tries to incorporate rebellious ideas and lyrics in compilation of dance moves. The essence of the work shop represents a poetic-political dance and music performance based on the extraordinary work of Ghanean-German artist, activist & author May Ayim. The performance will be boosted by live music and May-Ayim texts from the diverse and brilliant artist Layla Zami (Saxophon, Kalimba, Sounds). This work shop takes place on Friday (1st of March) at 8pm, but it is advisable to get there at least 15 minute before the beginning so there is no interruption of the artists performance. Oxana Chi is the person behind the idea, the choreography, the dance and the dramaturgy. 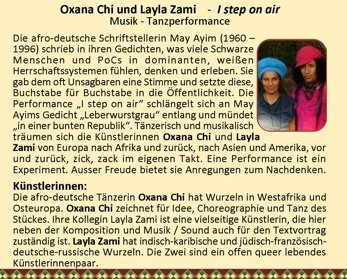 Layla Zami is the person behind the composition, the saxophone use , the kalimba , the sounds and the adaptation of the May-Ayim text.